With an emphasis on the benefits of an interprofessional team, the book describes the most effective approaches to health care delivery using healthinformation technology. 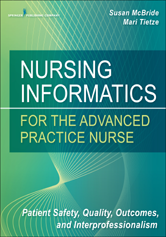 It describes a nursing informatics model that is comprised of three core domains: point-of-care technology, data management andanalytics, and patient safety and quality. 15 Personal Health Records and Patient Portals - Tietze Mari, Winters Cristina, and Hoelscher Stephanie H.
26 “Big Data” and Advanced Analytics - McBride Susan, Powers Cynthia, Gilder Richard, and Philips Billy U., Jr.
28 Electronic Clinical Quality Measures: Building an Infrastructure for Success - McBride Susan and Barnes Itara K.